My daughter was a year old - crawling but not yet walking and my son was four. When we went outdoors that spring my son went to his dirt pile for some serious digging and my daughte r played with plastic toys, stuffed animals, books – whatever we placed nearby. It was a hot day. I put a large bowl of water near my daughter and her toys. My son wanted water too and filled a bucket. He dumped the water into his dirt pile - transforming it. "Oh"!” he yelled. “It's gooey!” Those weren’t his exact words but he did say something enticing about the mud. My daughter, usually so absorbed in her toys and not yet exploring further, took notice. Her brother dumped more water into his dirt pile. "Look. We have to stop it!” Those might not have been his exact words either but he did say something about how important his work was, digging in the dirt, diverting the water. He dumped more water. “Come on Leah!” She happened to be wearing a new dress, a recent birthday gift. 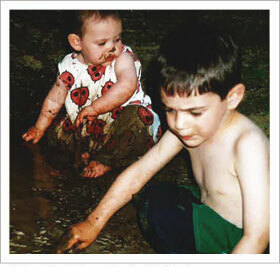 As she crawled toward her brother in the mud I had the passing thought - Should I take that outfit off of her? But I didn’t and let her keep going. She crawled toward and then right into the mud. They had played together before but my daughter hadn’t yet joined him in his digging or the pretend play that went along with it. “Dig Leah! Dig!” She did her best to keep up. She grabbed the pointy metal shovel we had given her brother so he could make headway in the hard dirt when the plastic shovels kept breaking. But when I tried to give her a plastic shovel instead she resisted. So I watched her carefully as she dug with a sharp metal shovel while wearing a fancy outfit in a mud puddle with her brother. They enjoyed each other like they never had before in that muddy corner of the back yard. Mud paint: Fill a cup with dirt and water and mix to create mud paint. Use sticks or paintbrushes to paint on paper or the sidewalk. Construct mud objects: Shape mud pies or sculptures. Children can decorate with pebbles, or other found objects if they like. Ask: what would happen if you add more water? More dirt? Leave it to dry in the sun? Tell us about your favorite mud moments and memories!